Even though it is one of Europe’s most popular holiday destinations, the so-called ‘Baltic region’ is not, in fact, officially a place at all, with definitions for what exactly constitutes ‘the Baltics’ varying from person to person and depending on the context in which the area is being discussed. Something that everyone who has visited this charming corner of Northern Europe can agree on, however, is that the region (which, for our purposes, is made up of the countries that have shorelines along the Baltic Sea) is truly rich in historic architecture and cultural heritage, and is very much underrated in this regard. 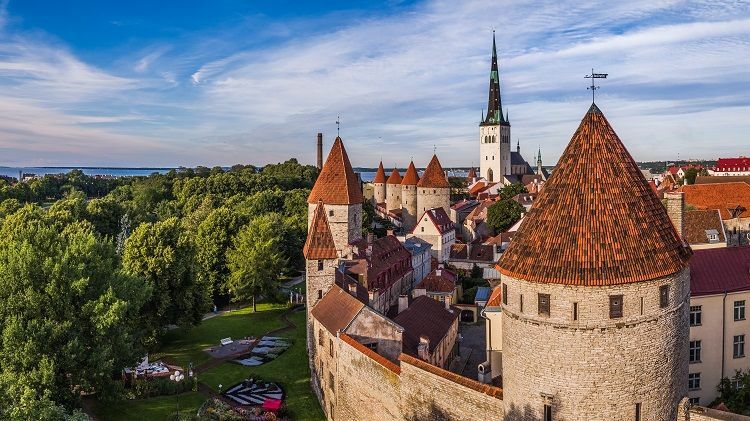 Below, you will find some recommendations as to which ancient castles, palaces and landmarks – along with a number of other fascinating attractions – you should be sure to visit when you next take a trip here on a Baltic cruise. 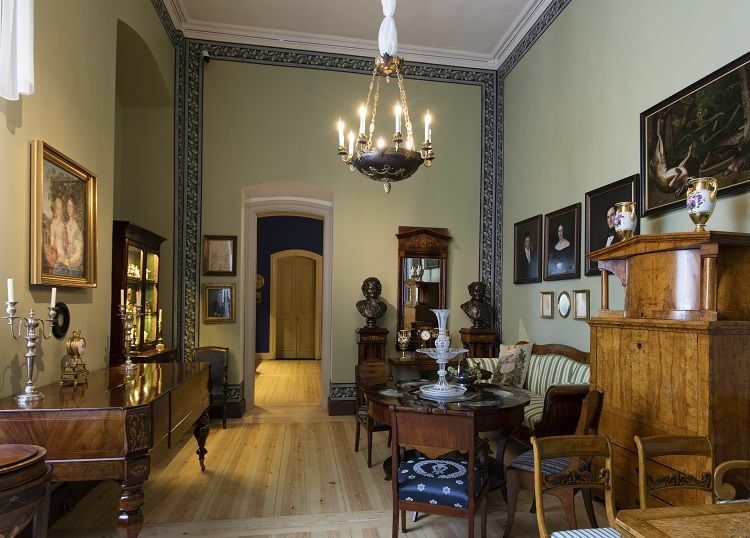 “Enter the home of Count and Countess Walther and Wilhelmina von Hallwyl, one of Stockholm's most eccentric and engaging museums. This palatial residence was built as a winter home for the immensely rich couple and completed in 1898. “Wilhelmina always planned for the house to become a museum, and in 1920 Walther and Wilhelmina von Hallwyl donated their Stockholm mansion together with its contents to the Swedish state. The terms of the bequest stipulate that the house must remain essentially unchanged. “Wilhelmina’s vision became a reality in 1938 when the Hallwyl Museum was first opened to the public, eight years after her death. The house has been preserved exactly as it was left, and situated among the objets d'art are personal peculiarities including a chunk of the Count's beard and a slice of their wedding cake. “Behind the facade of No. 4 Hamngatan the wondrously preserved series of rooms, as originally furnished by Wilhelmina von Hallwyl, stands as a unique testimonial to the lifestyle and décor of the late Victorian period in Sweden. “Guided tours of the museum take place daily. Discover the elegant and fascinating home of collector Wilhelmina von Hallwyl. 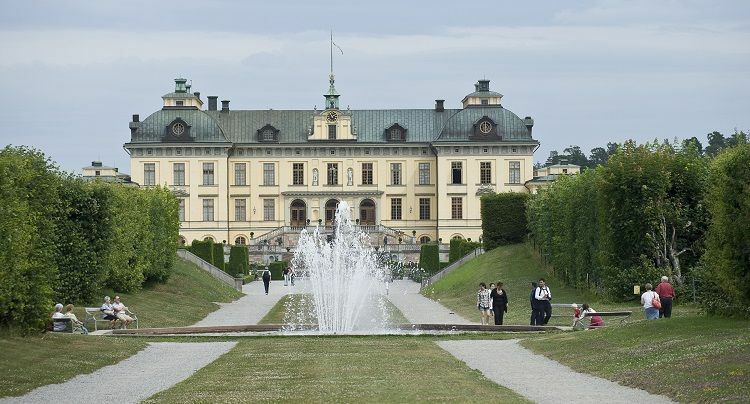 “Drottningholm Palace is on UNESCO's World Heritage List. 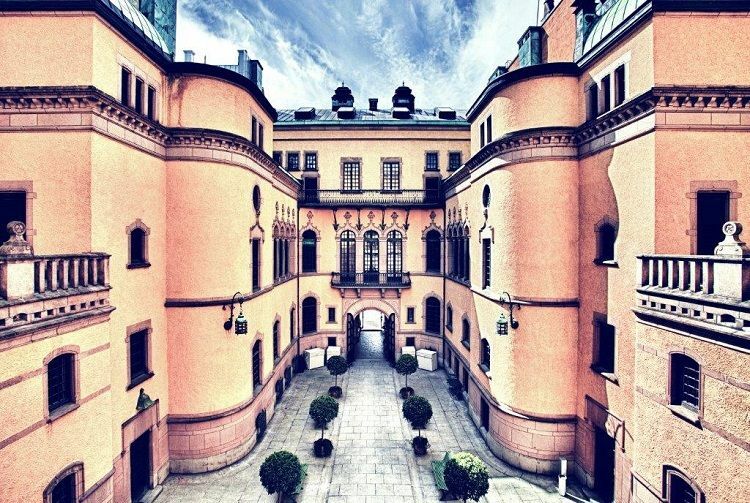 It is the best-preserved royal palace built in the 17th century in Sweden and at the same time is representative of all European architecture for the period. 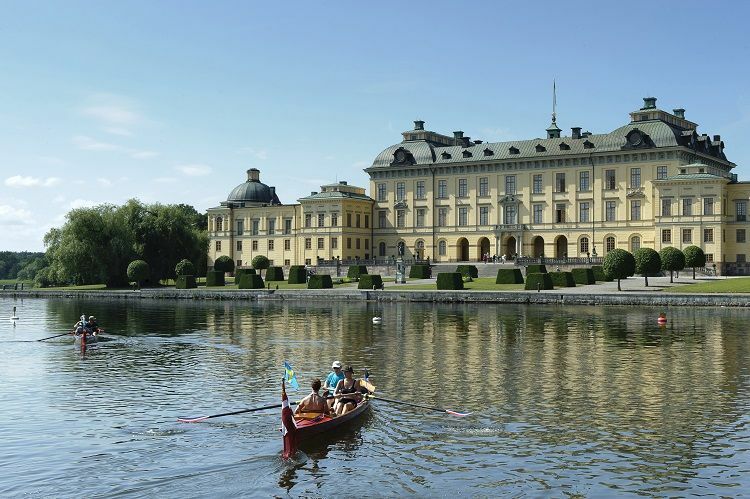 For more than 400 years Drottningholm Palace and its surroundings have been places for recreation and cultural encounters for royalties and tourists wishing to leave Stockholm for a few hours or more. 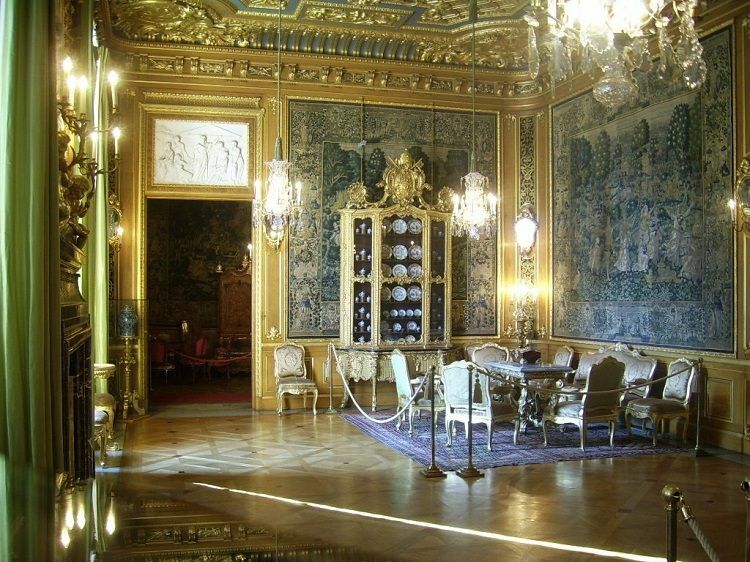 “Make a day trip to Drottningholm and experience a historic milieu of the highest international standards. The combination of the exotic Chinese Pavilion pleasure palace, the Palace Theatre and the magnificent palace gardens make a visit to Drottningholm a unique experience. “Influenced by French prototype, the palace was built by architect Nicodemus Tessin the Elder by commission of Queen Hedvig Eleonora. A number of royal personages have since then left their mark on the palace. Queen Lovisa Ulrica, sister to Frederic the Great of Prussia, commissioned the building of the Palace Theatre, still in use, and was given the Chinese Pavilion as a birthday present in 1753. Her son, Gustav III, who often used the theatre for setting up his own plays, was later shot at the opera house in Stockholm. 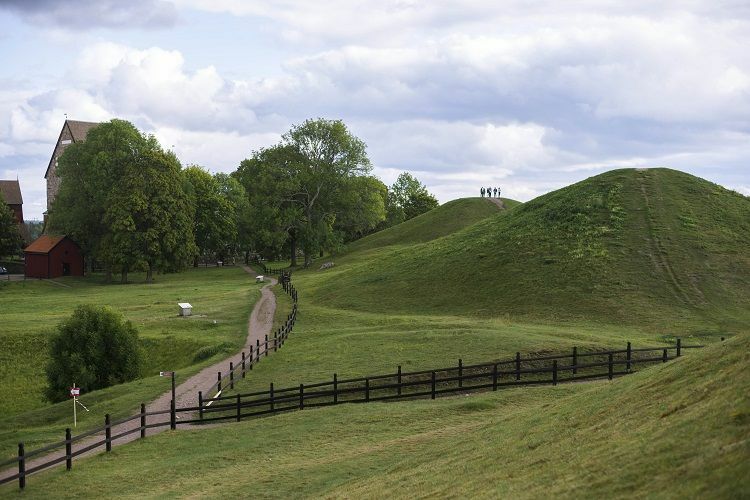 “In Gamla Uppsala, you will find the mighty royal mounds. Each mound was constructed for the burial of a once very powerful person, together with everything that person would need in the afterlife. Gamla Uppsala’s religious, economic and political significance reaches back many, many centuries and taking a trip there is to truly understand the relatively fleeting nature of the civilisations and societies we tend to think of as having existed since time immemorial. 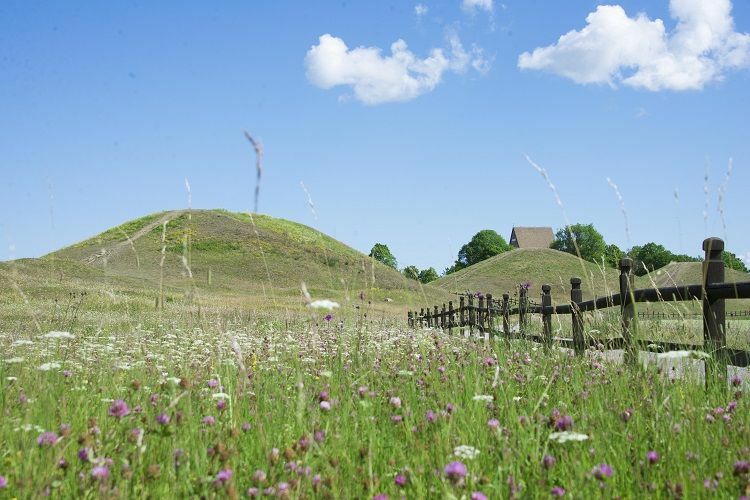 One of the most evocative ‘tourist attractions’ you will ever visit, Gamla Uppsala offers an incredible insight into Swedish history. 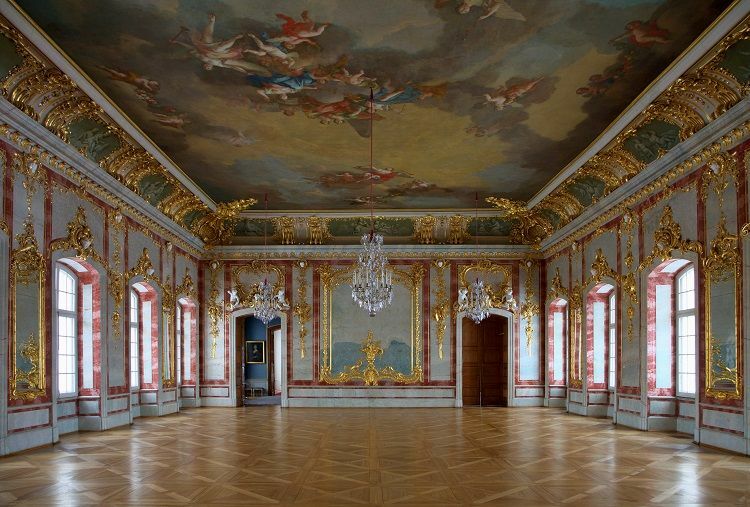 “[Rundale Palace was the] summer residence of the Duke of Courland, Ernst Johann Biron, built according to the architectural design of the architect Francesco Rastrelli from 1736 to 1740, and from 1764 to 1768. “In 1972, the Rundale Palace Museum was established and the restoration of the architectural ensemble of the palace was commenced. 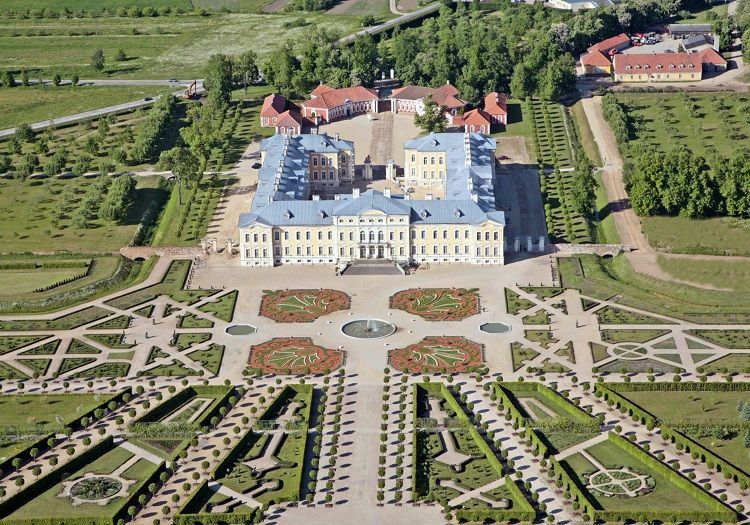 “The Baroque garden of Rundale Palace (10 ha) was created under the leadership of gardeners Christopher and Michael Weyland (1736–1740) and was restored by the museum, preserving the initial layout as it was designed by Rastrelli. 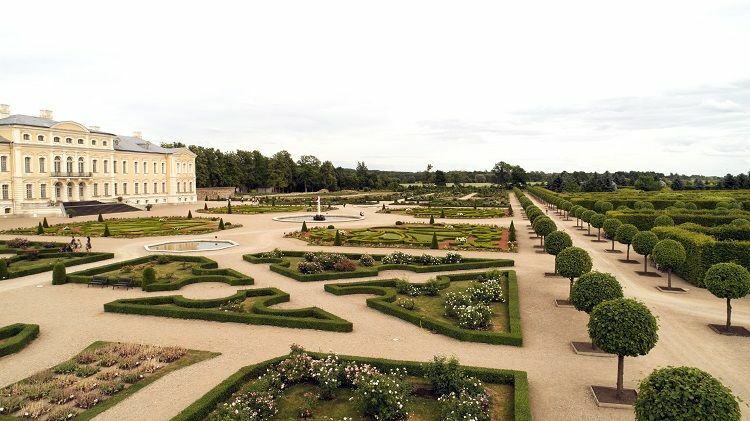 Now it displays all the characteristic elements of Baroque gardens – an ornamental parterre, a fountain, the Green Theatre, bosquets, pergolas, pavilions and a labyrinth. 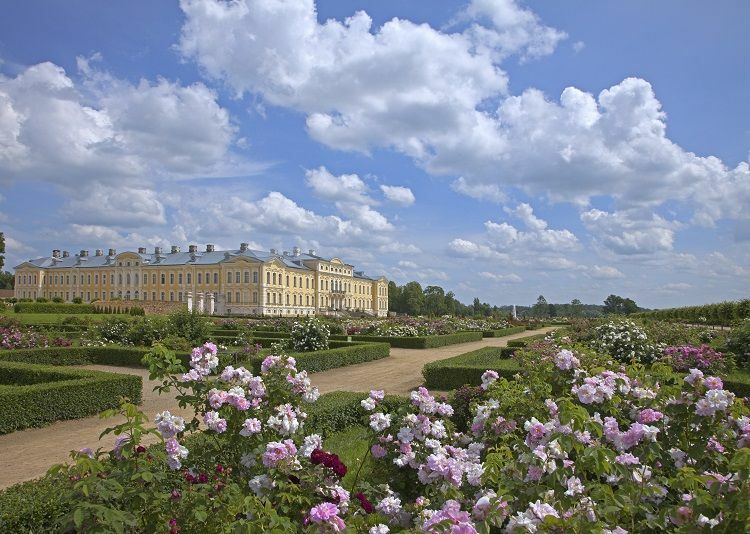 It also includes a rose garden (boasting around 2,200 varieties of rose), a collection of decorative trees and shrubs, and plantations of summer flowers and perennial plants characteristic of the 18th century. “On the south side, the Palace borders a hunting park, whereas the area on the north side is used for economic activities. A hothouse with plants popular during the time of Countess Shuvalova (mid-19th century) has been built beside the old palace inn. Of course, Latvia’s significant military past cannot – and should not – be overlooked or written out of the history books, and there are numerous museums and other attractions that delve into the lengthy and complex ways in which this relatively small nation has played a major role in some of Europe’s biggest conflicts. “The building was erected in about 1900 and, until 1997, served as a place where military persons served their terms for breach of discipline. Ever since the first years of its existence, it has been a place to break people’s lives and suppress their free will. “With powers changing, its prisoners changed as well – among them, there were revolutionaries, seamen and non-commissioned officers of the tsarist army, deserters from the German Wehrmacht, enemies of the people from Stalin’s time, soldiers of both the Soviet army and the Latvian army, and other rebels. 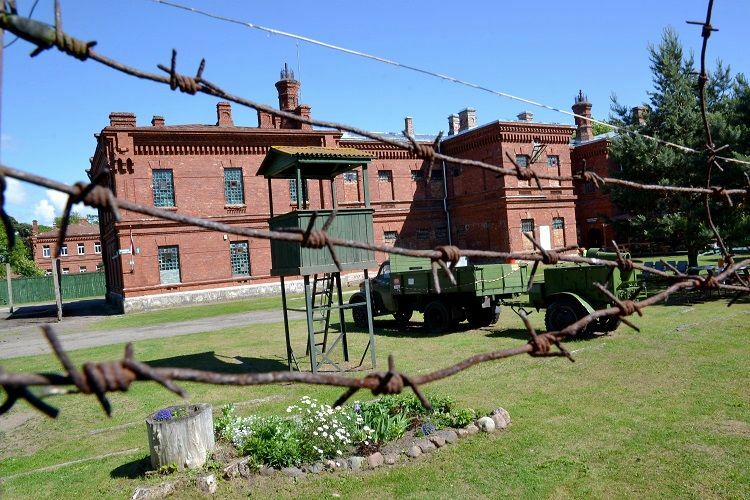 “Today, everyone can visit Karosta Visitors Centre, see Karosta Prison and even stay overnight there. “The first ‘Behind the Bars’ show occurred on September 27th, 2002, and was arranged by the Lejaskurzemes Tourism Information Office. It was a programme specifically made for staff members of the current Liepaja Tourism Exchange – individuals from the tourism information offices of Liepaja, Riga, and also from foreign countries. 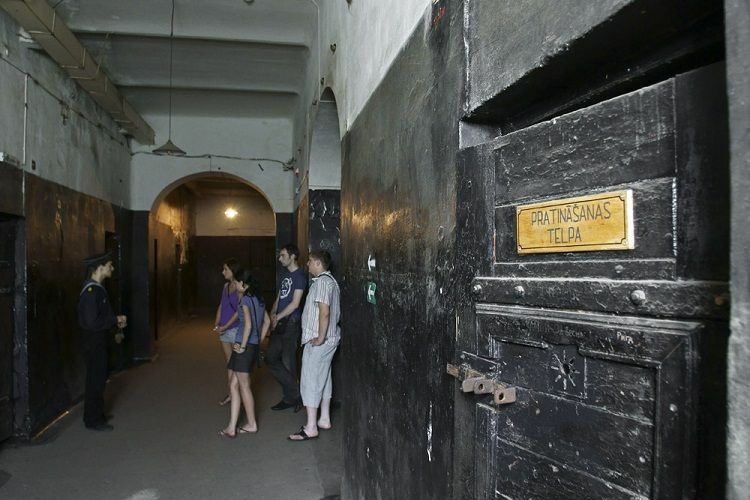 “Since the invited tourism experts acknowledged the show to be unique and interesting, the Lejaskurzemes Tourism Information Office decided to offer the ‘Behind the Bars’ experience to tourists, as well. “Like many other buildings in the Karosta area, the Karosta jail building was heavily damaged over time by vandals. There was no heating, no water supply, and no electricity. All props for the show had to be delivered by car. During the winter, the weather temperature was sometimes as cold as -15C. However, those who wanted to participate were many. “The show became very popular very soon. In May of 2003, for example, more than 3,000 students participated. 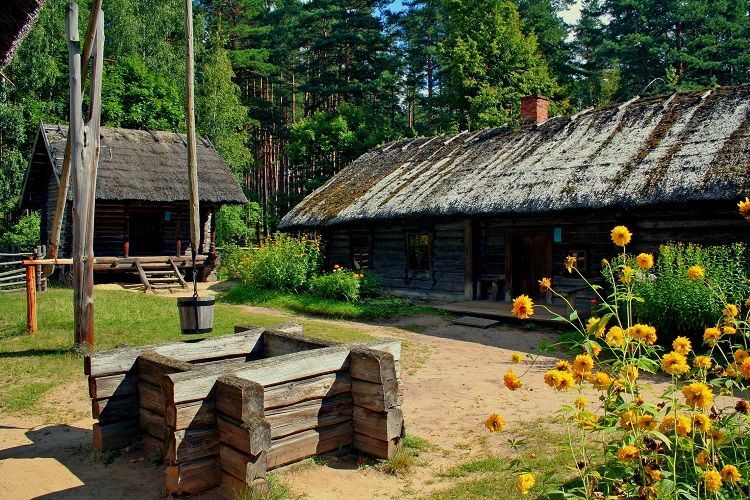 “The Ethnographic Open-Air Museum of Latvia was established in 1924 and now exhibits more than 118 historical buildings. 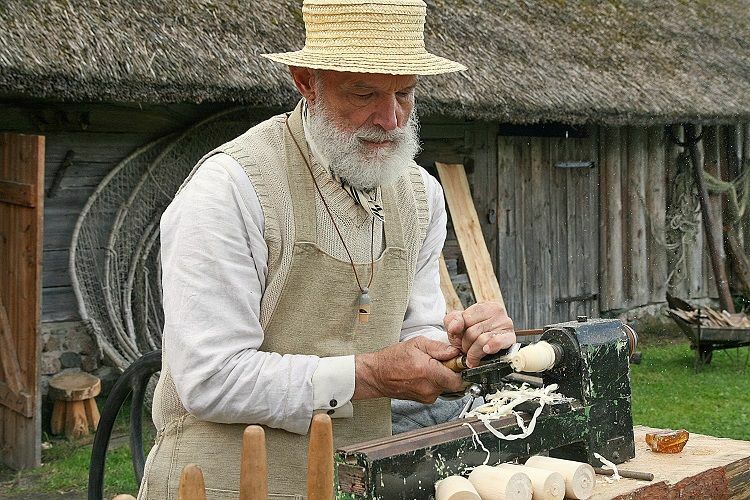 On the beautiful shores of Lake Jugla, the museum in its 87-hectare territory shows the life of peasants in the Latvian countryside from the end of the 17th century till the middle of the 20th century. “In the museum’s natural and authentic environment visitors can get acquainted with the cultural heritage of Latvians and other nations historically living in the territory of Latvia and visit all the cultural and historical areas of Latvia — Kurzeme, Zemgale, Vidzeme and Latgale — in one place, thus enjoying a rural environment without leaving the city. 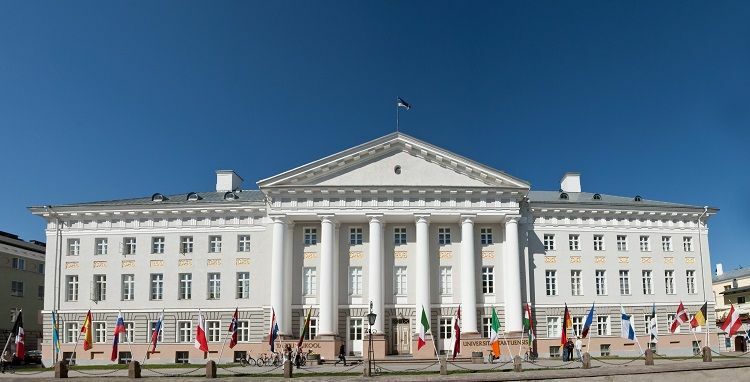 Estonia’s ‘second city’ is Tartu, widely regarded as the country’s cultural, intellectual and artistic hub. Like many ancient European cities, many of Tartu’s most important buildings, landmarks and activities are centred round its main ‘square’. 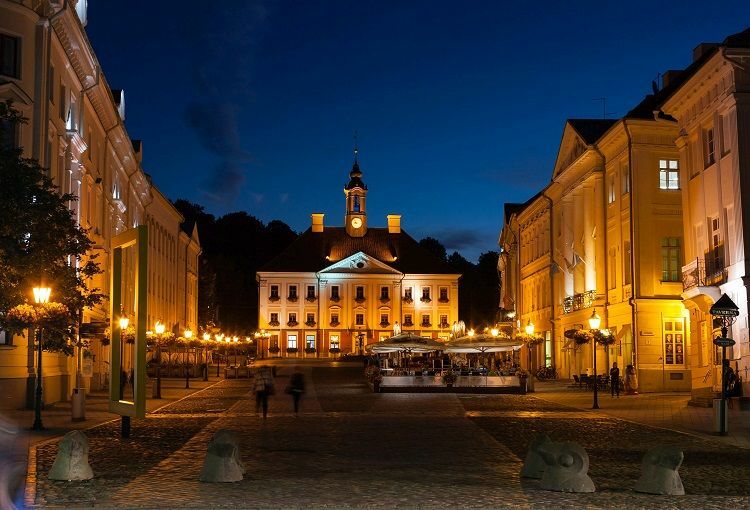 “Since ancient times, the Town Hall Square has been the centre of Tartu. It was the main trading area of the settlement between the castle on the Toome Hill and the riverside port on the Emajõgi. This tradition was upheld for centuries. In the Middle Ages, the seat of municipal power – The Town Hall – was erected. “The present building is already the third one on the same site. 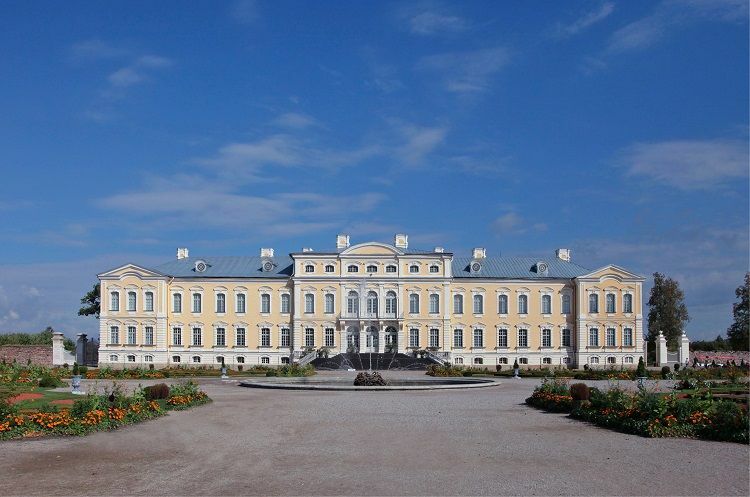 In comparison with the long history of Tartu its buildings are relatively new: very seldom can you see buildings that date back to earlier than the last quarter of the 18th century, which is the result of numerous devastating wars and fires. The Great Fire of 1775 ravaged almost the whole central part of Tartu. After the fire, Tartu began to obtain its present configuration and the Town Hall was also built. The original Town Hall of Tartu was designed by the master-builder of the town, Johann Heinrich Bartholomäus Walter (1734-1802) from Rostock. The cornerstone was laid in 1782. Although the Town Hall was festively opened in 1786, the finishing touches were not made until 1789. 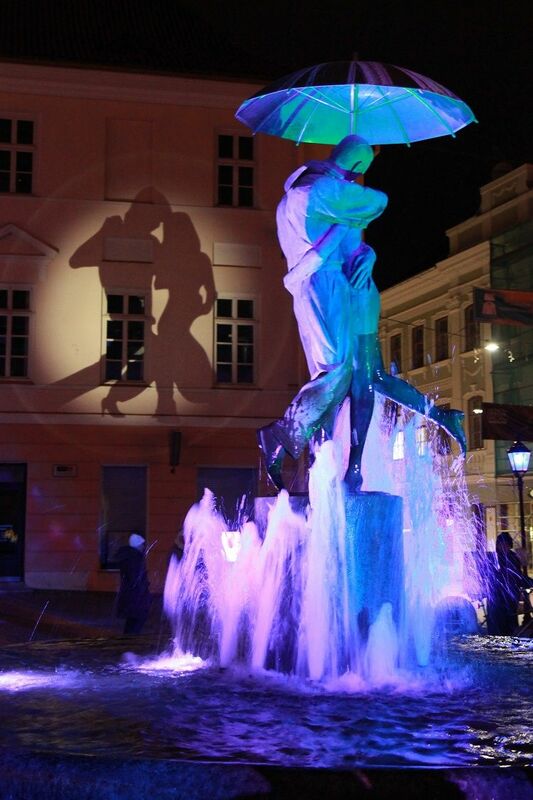 “'The Kissing Students' sculpture and fountain in front of the Town Hall is one of the most recognised symbols of Tartu. A fountain has stood in the same place since 1948, when newlyweds and their guests would visit it for luck, and people would also take a dip in it. The sculpture was created by Mati Karmin and completed in 1998. Since 2006, the fountain has been surrounded by tiles bearing the names of Tartu's twin towns: Bærum, Ferrara, Fredriksberg, Hafnarfjörður, Hämeenlinna, Kaunas, Lüneburg, Pihkva, Riia, Salisbury, Tampere, Turu, Uppsala, Veszprem, Zutphen and Deventer. They are situated in the direction that the cities lie from Tartu, marking the distances. One of the most enjoyable parts of travelling to a new country - enjoying its traditional food and drink - should not be ignored, and there is an attraction in Estonia that allows guests to combine this with discovering a building of great historical significance. “The windmill was built in 1899. Before that on this spot was the first Eastern Orthodox Church in Kuressaare that burned down at the beginning of the 1780s during the fire in the city. “The windmill was in working order until 1941. When the war began, the sails were sawn off in order to prevent the enemies using them for signalling. It is known from the history that during World War I the French, using the sails, gave signals about movement directions and even about the number of enemies to their own troops. After the war, the windmill was used as a store, and the miller’s living area – in the left protrusion from the front view – as an apartment. 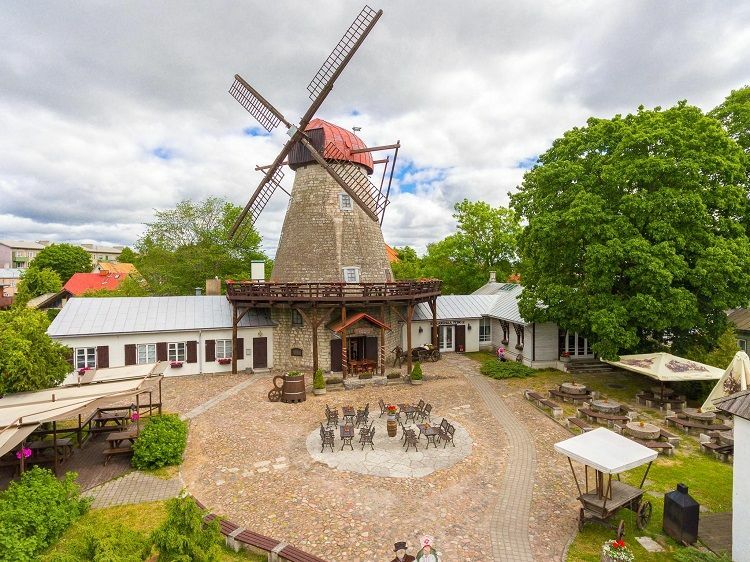 “In order to improve the catering conditions in Kuressaare to benefit the increased number of tourists seen from the end of the 1960s, the restoration of the windmill with the aim of using it as a café started in autumn 1972, led by architect Fredy Tomps. The interior design was made by architect Aet Maasik. During the restoration, care was given to preserving the original Dutch stone windmill structure. “On 4 January 1974, Café Veski opened to visitors. Immediately after the opening, the café became one of the most popular places in Kuressaare city, and at the moment we are the oldest operating catering establishment in Kuressaare. ‘Veski’ is an architectural monument of national importance. 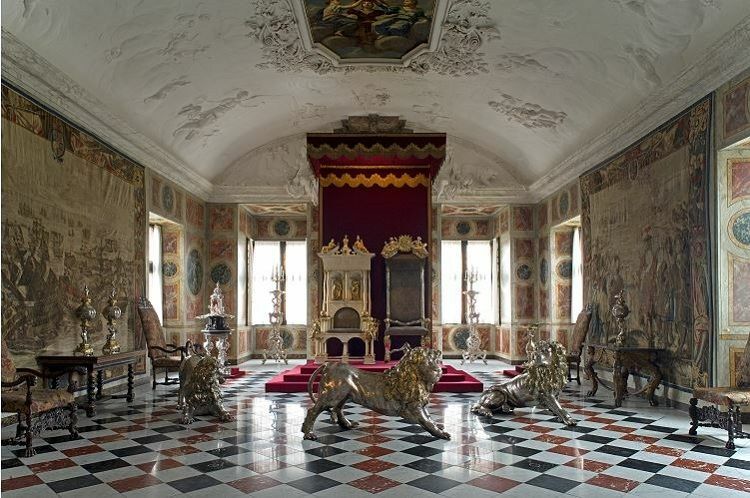 “A royal hermitage set in the beautiful King’s garden in the heart of Copenhagen, Rosenborg Castle features 400 years of splendour, royal art treasures and the nation’s well-guarded Crown Jewels and Royal Regalia. “Rosenborg Castle was built by one of the most famous Scandinavian kings, Christian IV, in the early 17th century. Christian IV fathered more than 20 children, was a patron of the arts and built some of the most significant buildings in Copenhagen. Among his many castles, Rosenborg became his favourite (and in 1648, at the age of 70, his dying wish was to be taken by sleigh in the dark of winter from Frederiksborg Castle to Rosenborg Castle, which had provided the setting for so many years of his life). 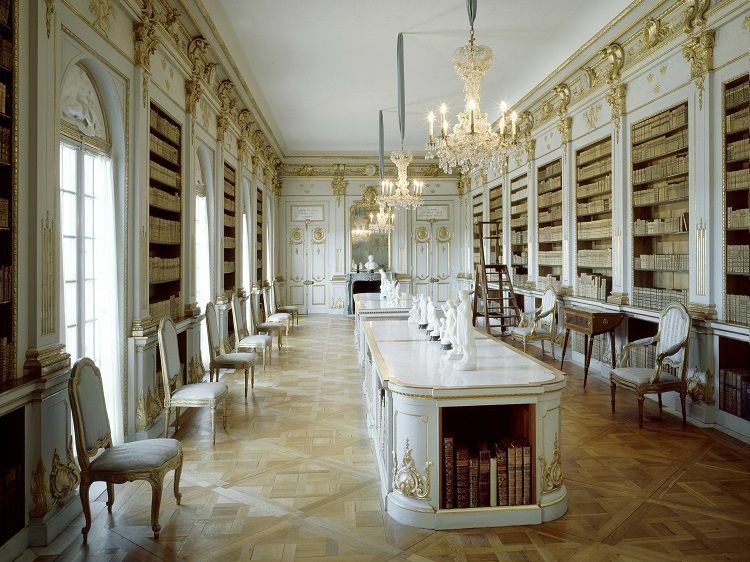 “Today, the pomp and circumstance of the past can be experienced through the numerous impressive belongings of Christian IV and his descendants. Among the main attractions is the Knights’ Hall, with the coronation thrones and three life-size silver lions standing guard. The king’s coronation throne is made of narwhale tusks with gilt figures and the queen’s is carried out in silver. On the walls tapestries commemorate battles between Denmark and Sweden. “The interiors are well-preserved and invite the visitor to take a journey in time. The visitor can experience the king’s private writing cabinet, his bathroom and see wax figures of former royal inhabitants. 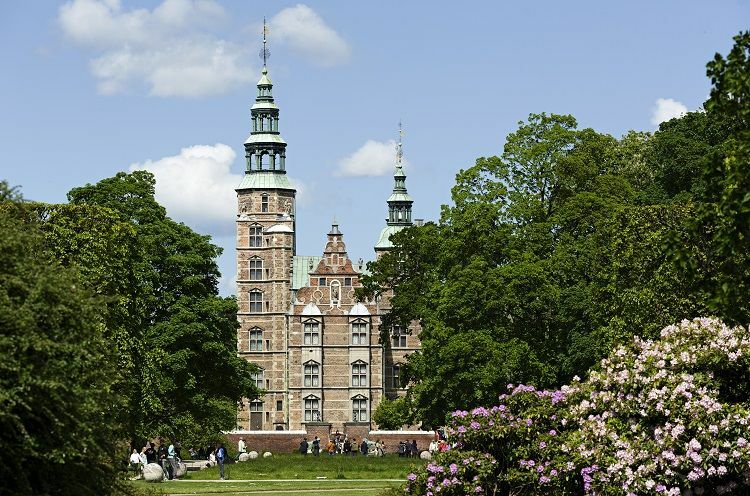 Rosenborg also houses an exquisite collection of Flora Danica and one of the world’s finest Venetian glass collections, both set in tower chambers. 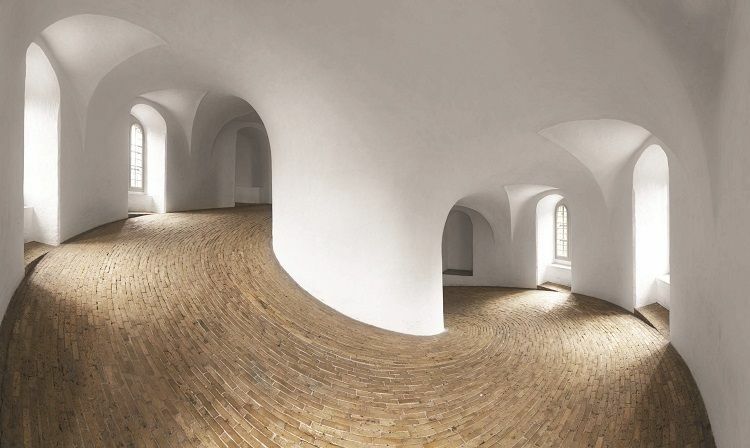 Rundetaarn interior (Image Credit – Peter Hartley). The spiral ramp twists 7½ times around the tower’s hollow core and is the only way to the top. It is inspired by both German Renaissance castles and ancient structures and is unique in a Danish context. “Discoveries have been made in the Round Tower. Institutions have started here. Important historical figures have come here. And people from all walks of life have passed each other in search of Copenhagen’s most charming view 34.8 metres above the street. The whole world passes through the Round Tower and has done so since 1642, when it was finished - a historical place that also houses exhibitions, concerts and activities for young and old. 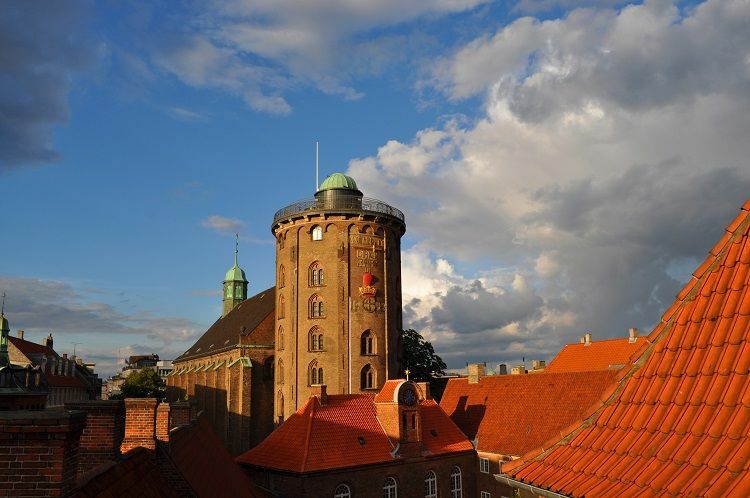 “With its distinctive spiral ramp, the Round Tower is one of Denmark’s best-known and most visited structures. It was built as a platform for the university observatory and for centuries it was the centre of Danish astronomy. The foundation stone was laid on 7/7 1637 and five years later the Round Tower was finished as the first part of the Trinity Complex, which was designed to accommodate three things: the observatory at the top of the tower, the university library above the Trinity Church and the church itself below. “The Round Tower is built by King Christian IV, who constructed its round walls in the royal colours of yellow and red. The King himself also sketched the famous golden rebus on the front of the tower: ‘Lead, God, the right teachings and justice into the heart of King Christian IV’. “Halfway up the tower you will find the Library Hall, which has been a venue for exhibitions, concerts and cultural events since its reopening in 1987. The tower platform on top has a great 360-degree city view centred by the observatory, which is still used in the winter months and is thus the oldest functioning observatory in Europe. Finally, we head to Finland – a nation which, like the others we have discussed – excels in terms of both the natural and manmade highlights it boasts. Whilst we have mainly discussed the latter in this article so far, we have chosen to end by highlighting a Finnish destination that offers the best in terms of both fascinating heritage and stunning countryside. “Fiskars Village, founded in 1649, was one of the first Finnish ironworks and forerunners of industry. The village was known for producing not only iron, but later on also quality cutlery, knives and, of course, orange-handled scissors. Today the village is a unique and versatile destination where design, art and handicraft meet nature, history and architecture. Here, at the birth site of the Fiskars company, you can enjoy several days filled with experiences for all your senses. 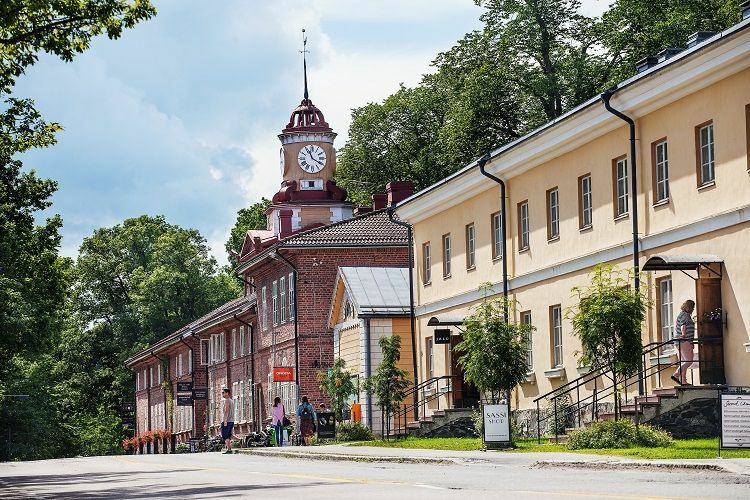 “The region has attracted craftspeople and artistic-minded individuals for centuries, and Fiskars is today well known as a centre of Finnish art and design. The Onoma cooperative was established in Fiskars in 1996 and its 113 members all live or work in the area. There are over 30 boutiques and workshops where one can find local craft products and unique design items. 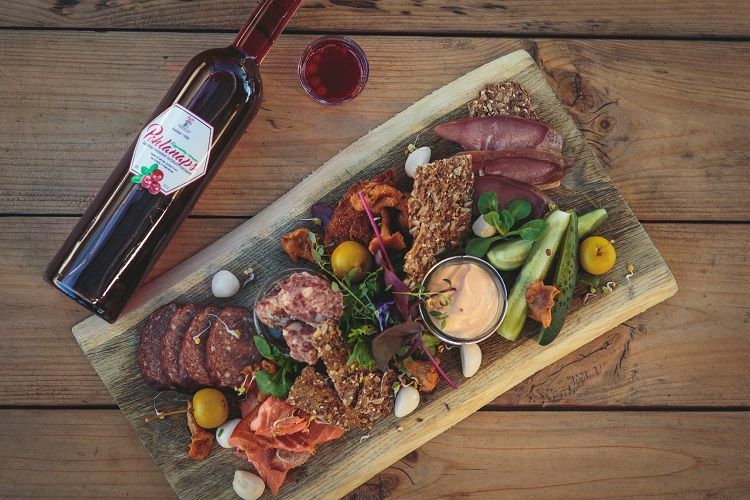 At the local distillery’s tap room, you can taste beers, ciders and spirits made from natural ingredients and seasoned with local herbs and berries. The restaurants and food events serve seasonal food made out of local ingredients. 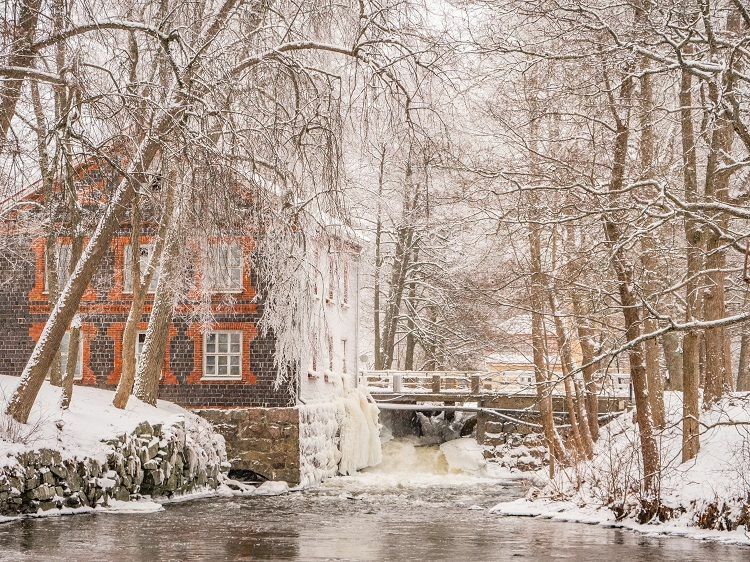 “Fiskars Village is located in a beautiful river valley, surrounded by lakes, forests and cultural landscapes. Nature trails can be enjoyed by walking or on a mountain bike that can be rented from the Fiskars Village Trail Center. Mountain bike trails cover almost 70 kilometres and some interesting walks include the tree spotting path, introducing 23 different species found in the area.